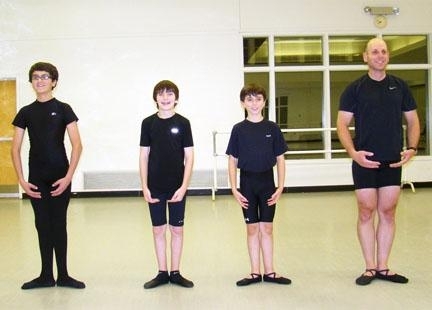 SARATOGA SPRINGS — Échappé, jeté, plié are not words used commonly in most classrooms, and certainly not classrooms occupied by a handful of teenage boys. But Raul Martinez’s ballet studio, and his Friday evening boys’ ballet class is not your typical classroom. Martinez, director of the School of Arts at the National Museum of Dance, started the class over the summer with the hope of training more male dancers. He says that dancers in the class have to overcome a stigma associated with men who dance — particularly those who wear tights, as is the custom in ballet. So far, the class has attracted four students, ages 9, 12, 14 and 42. Camm Epstein volunteered to take the class with his son, Sam. “It’s a great opportunity to do something with my son,” he said, noting that he had volunteered to take the class with his son as a way to show that dancing does not have to be emasculating. For Sam, who started dancing as a child before taking a hiatus, the fun is simpler. “I like the spins and jumps,” he said. While seeing young boys in ballet classes is not unusual, Martinez noted that as boys get older, dancing with girls looses its appeal and becomes counter-productive in the education of a young dancer. “Sooner or later, boys drop, because they are dancing with women forever, and they develop female movements,” said Martinez. The men’s ballet class is an attempt to provide a supportive atmosphere for male dancers, while ingraining in the students the idea that dancing — even in tights — is not an effeminate activity. So far, Martinez is content to have one class, which combines dancers of various skill levels. Later on, he said, classes for men would be broken out by age groups — no dads in the dance class — or skill levels. Between the two, it’s generally accepted that Sam, the limber 9-year-old, is the better dancer. The classes’ star pupil is less certain. Joining Sam and Camm Epstein in the class are Bryce Bouchard, 12, of Ballston Spa, and Kyle Marra, 14, of Clifton Park. Each claimed different reasons for taking up ballet. “I saw my sister do it, and I thought I could do better,” said Bouchard, who started dancing when he was 5. Now, he says he and his sister [are] “neck-and-neck” for family honors of most talented dancer. Marra, on the other hand, sees ballet as a foundation in his dance education. He hopes to go to school for dance later in life. For more information on the National Museum of Dance’s School of the Arts, call 581-0858, or go to www.dancemuseum.org/school.